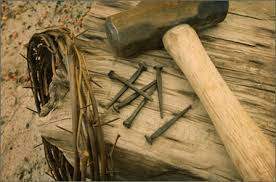 Christ lag in Todes Banden (Christ lay in death's bonds), BWV 4,[a] is a cantata by Johann Sebastian Bach. The title also appears as Christ lag in Todesbanden. It is one of Bach's earliest church cantatas, and was probably intended for a performance at Easter in 1707, related to his application for a post at Mühlhausen. It is an early work in a genre to which he later contributed complete cantata cycles for all occasions of the liturgical year. John Eliot Gardiner describes the work as Bach's "first-known attempt at painting narrative in music". The cantata is a chorale cantata, a type of composition in which both text and music are based on a Lutheran hymn, in this case Martin Luther's hymn of the same name, the main hymn for Easter in seven stanzas which is based in text and tune on Medieval models. 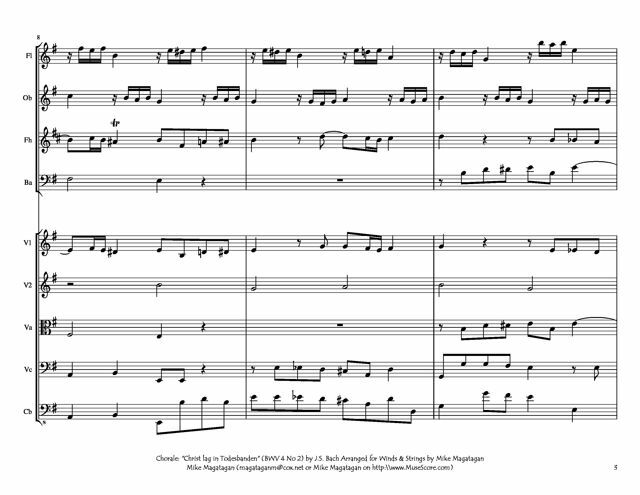 In the format of chorale variations "per omnes versus" (for all stanzas), Bach used in each of the seven vocal movements the unchanged words of a stanza of the chorale, and its tune as a cantus firmus. 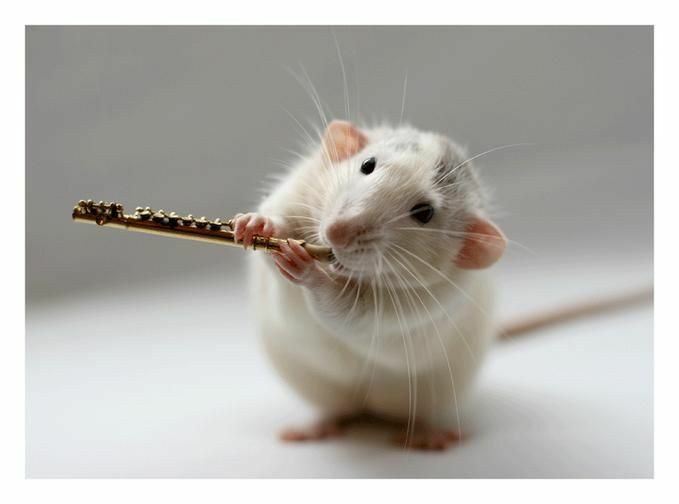 After an opening sinfonia, the variations are arranged in symmetry: chorus – duet – solo – chorus – solo – duet – chorus, with the focus on the central fourth stanza, about the battle between Life and Death. Although all movements are in the same key of E minor, Bach employs a variety of musical forms and techniques to intensify the meaning of the text. Christ lag in Todes Banden is Bach's first cantata for Easter, also his only extant original composition for the first day of the feast. He later repeatedly performed it as Thomaskantor in Leipzig, beginning in 1724 when he celebrated Easter there for the first time. Only the performance material from Leipzig is extant. It shows a scoring for four vocal parts, a string section of two violins, two violas and continuo, and a choir of cornetto and trombones doubling the voices at times. The scoring of the first performances was possibly similar, in the style of a "Choralkonzert" (chorale concerto) from the 17th century. Gardiner calls Bach's setting of Luther's hymn "a bold, innovative piece of musical drama" and observes "his total identification with the spirit and letter of Luther's fiery, dramatic hymn". Bach is believed to have written the work in 1707 when he was a professional organist aged twenty-two. He had been employed for a few years in Arnstadt as organist of St Boniface's church and was seeking promotion to a more important post, which he found at Mühlhausen in 1707. His duties as a church musician involved some responsibility for choral music, but the year when he began composing cantatas is unknown. 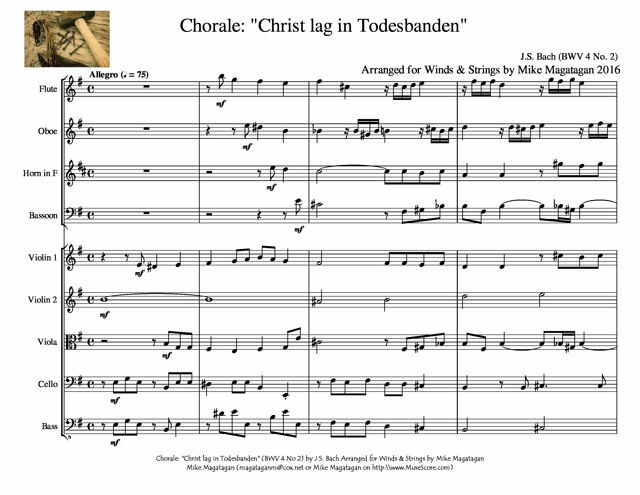 Christ lag in Todes Banden is one of a small group of cantatas which survive from his years at Arnstadt or Mühlhausen, and these early works include some fine writing. The Bach scholar Christoph Wolff suggests that Bach may have composed other early cantatas which he did not think worth preserving. In his first years of composing vocal music, until 1708, Bach wrote cantatas only for special occasions such as wedding and funeral. They were based on texts built from biblical passages and hymns. Features which were characteristic of his later cantatas, such as recitatives and arias on contemporary poetry, were not yet present. Instead, the works included elements from the seventeenth century such as motets and chorale concertos. The following table lists the seven extant works composed by Bach before he moved on to the Weimar court in 1708. Bach structured the cantata in eight movements: an instrumental sinfonia, and seven vocal movements corresponding to the stanzas of the hymn. The duration is given as 22 minutes. 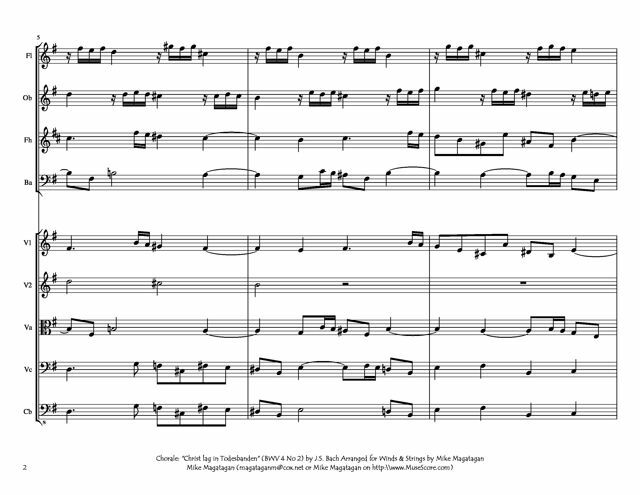 I created this arrangement of the first Chorale: "Christ lag in Todes Banden" (Christ lay in death's bonds) for Winds (Flute, Oboe, French Horn & Bassoon) & Strings (2 Violins, Viola, Cello & Bass).